You don’t often hear of someone spending their winters in New York because its warm, but that’s exactly what this beautiful Brant Goose (Branta bernicla) does each year, when he migrates south from his breeding grounds in the Arctic Circle. This year’s journey was close to ending in disaster. We don’t know how he got injured, but what we do know is that the Brant was brought in with a compound fracture: his leg was broken and the bone was protruding from the skin. This type of break has such a risk of complication that some rehabilitation centers won’t treat birds with this type of injury. But he didn’t go to just any rehab center; he came to the Wild Bird Fund. 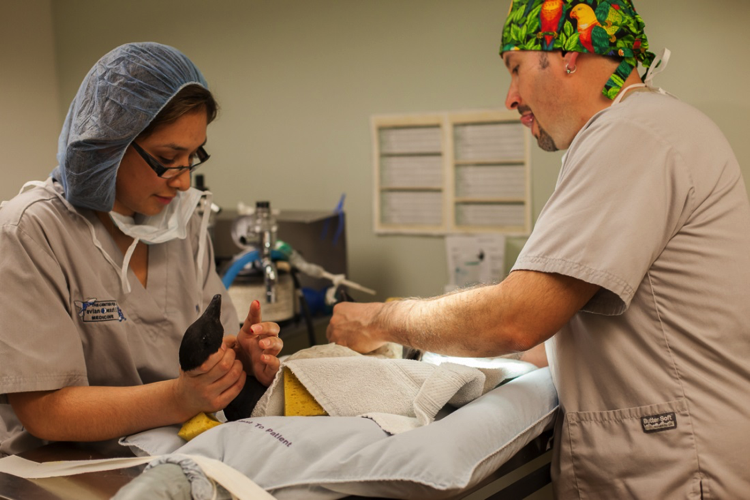 Dr. Pilny from the Center for Avian and Exotic Medicine carefully operated on his leg, removed a portion of infected bone and inserted a pin. The Brant was put on strict cage rest to allow his leg to set. He was with us for a long time while his leg healed, greeting anyone who opened his cage for cleaning or feeding with angry hisses and dirty looks. Although he was much smaller than his fresh-water cousin the Canada Goose, he certainly made up for it in attitude. Everyone at the Center was nervous when the time to came to remove the pin. Had his leg healed? Was it free of infection? Would he put weight on it? Yes. Yes. Yes. 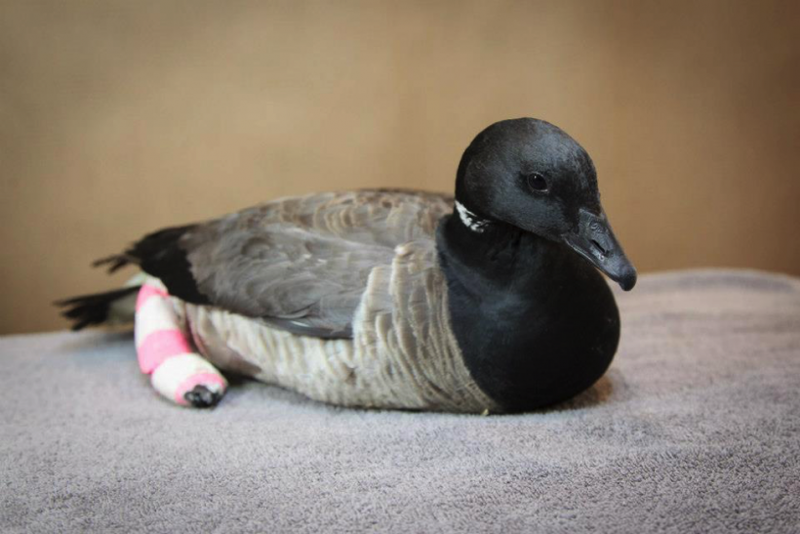 The Brant Goose, who undertakes one the most arduous migrations every year, had survived another season. 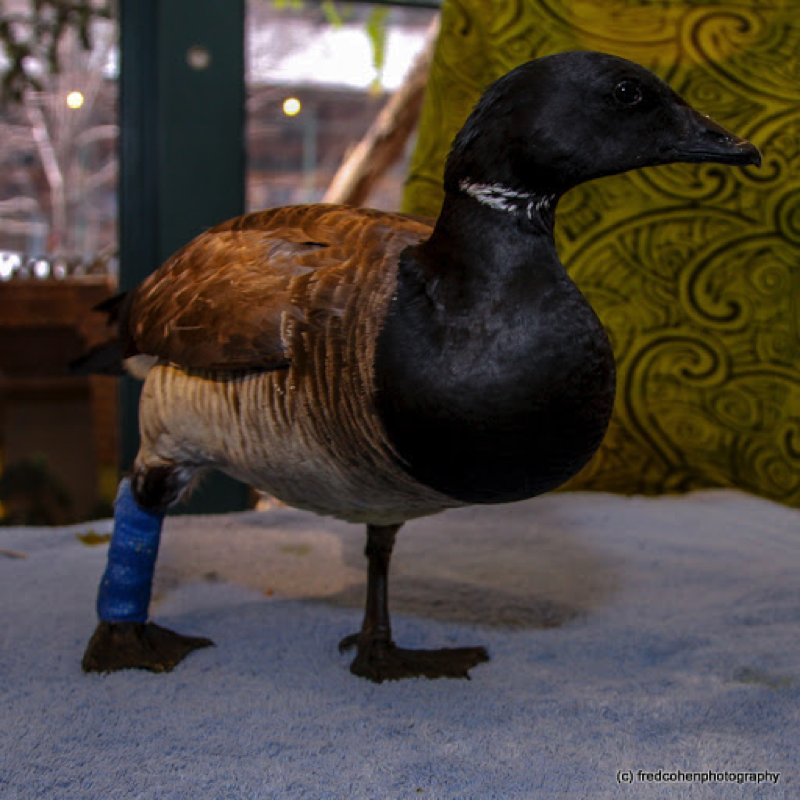 Because of his cast, the Brant was not able to swim or fly during his stay at the Wild Bird Fund. To prepare him for release, he was transferred to Stars in the Forest, a Long Island rehabilitation center where he spent the next weeks building up his flight muscles in their outdoor runs and exercising his newly-healed leg in the water. It was a challenge this little goose could handle. After all, he flew more than 1,000 miles just to get here.